This week, with help from our friends at Festival Foods, we have a Halloween Special Edition of Tasty Tuesday! In this video, we’re featuring two easy, healthy snacks that are perfect for sending to school, as an afternoon snack, or to feature at your Halloween get-together! They’re sure to please both kids and adults alike and offer a good balance of carbohydrate and protein without all the added sugars of other holiday treats. To learn how to make Cheese Broomsticks and Apple Spiders, CLICK HERE! Let us know how you like these and be sure to check back next week for more Tasty Tuesday recipes! 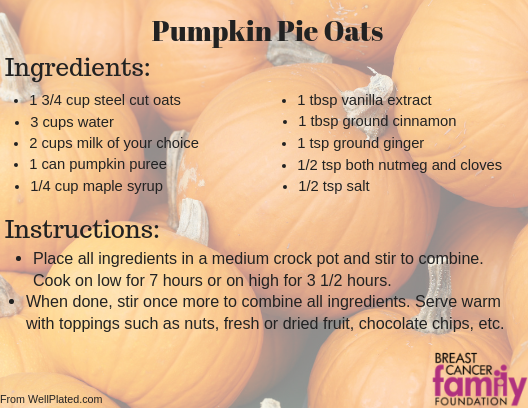 With fall in full swing, this week we’re highlighting a holiday favorite- pumpkin! 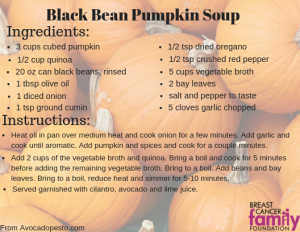 Pumpkin is a delicious addition to sweet and savory foods alike and offers a rich flavor and smooth texture. When adding pumpkin to your meal, it brings a great source of fiber which helps with weight control, keeping us full, and protecting against colorectal cancer. 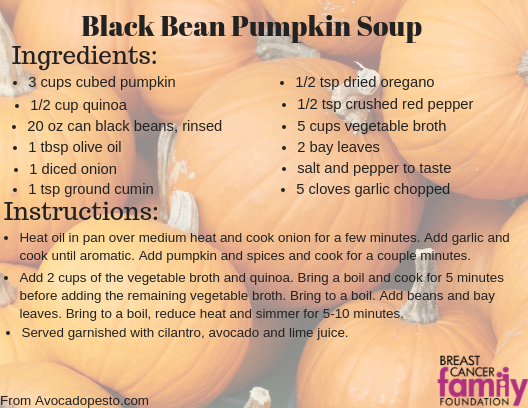 Pumpkin is also a great source of Vitamin A and C to name a few. When you’re cooking with pumpkin don’t forget the seeds! Roasted pumpkin seeds offer their own variety of nutrients and healthy fats. 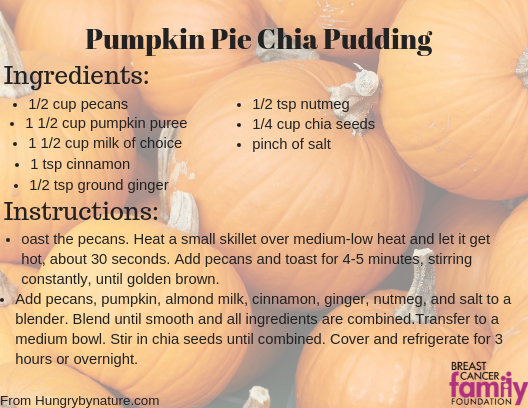 Try a few of our pumpkin centered recipes and let us know your favorite! Check back next week for a spooky edition of Tasty Tuesday! Our mission at Breast Cancer Family Foundation is to inspire people in our community to live healthy, cancer-free lifestyles and a huge piece of that starts with what’s on our plate. When teaching in the classroom about reducing cancer risk, I highlight the importance of taking care of our bodies from the inside out. Eating more whole foods and reducing the amount of processed foods that we eat goes a long way in not only lowering our cancer risk but also improving quality of life in general. I emphasis to the students that eating healthy doesn’t mean that you have to eat the same thing day in and day out or eat food that isn’t exciting or tasty. Going forward with our mission, we wanted to expand this message to the community as well. This has lead us to start thinking about what that next step looks like. If you’ve been following our Facebook page the last few weeks, you may have noticed something new. For the summer, we have started to highlight some of the delicious, seasonal vegetables that we have growing right in our backyard. With farmers’ markets just around the corner, we want to arm you with recipes to get the most out of your local produce endeavor. I find that it is easy to get stuck in a rut and it’s sometimes a struggle to come up with new ways to cook healthfully that the whole family will enjoy. That’s where Tasty Tuesdays comes in! Tasty Tuesdays is a way for us to expand our message that eating healthy can be fun and isn’t always one-size fits all. Each week we highlight a different fruit, vegetable, or herb and give you fresh and exciting ways to prepare it. 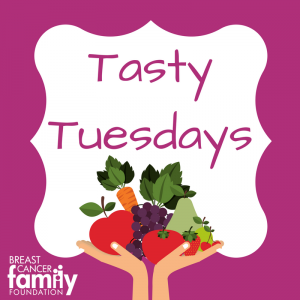 We also break down the nutrient profile of each Tasty Tuesday star and how it can help you reduce your risk of developing cancer. With Tasty Tuesdays, we are proving that eating well can be fun and taste good too! Keep your eye out for a new star every week and join us in tackling cancer one meal at a time! 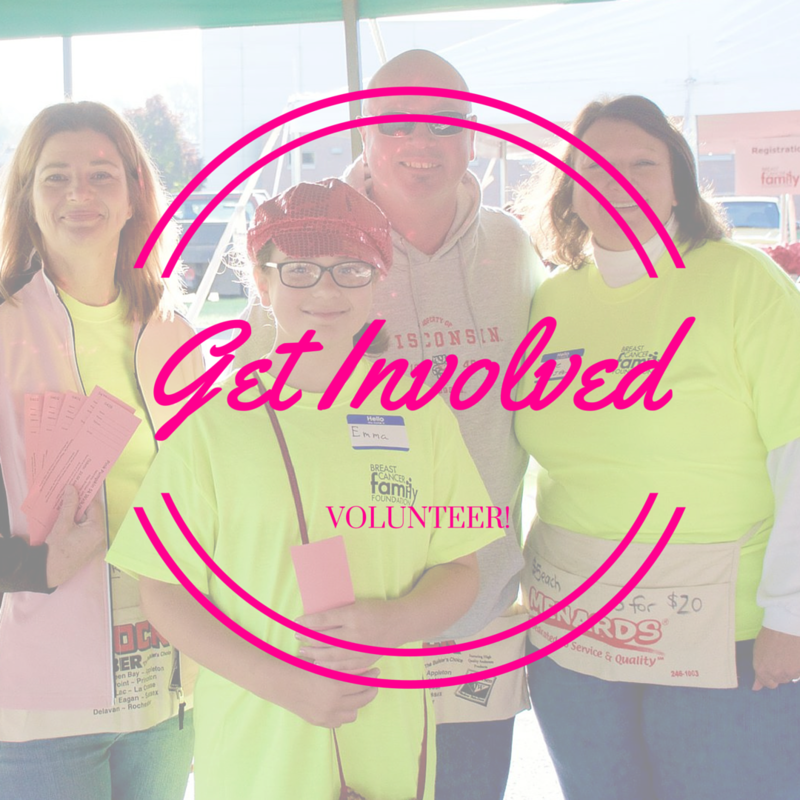 Here at the Breast Cancer Family Foundation, our mission is to empower our community and our youth by providing education on cancer awareness and prevention. Being new to the educator role, I like to share what my job entails with the people I’m close to in my life. When I tell my relatives and friends that I educate about cancer prevention I’m usually met with two comments. The first being “I thought you were a dietitian. How does that fit in with what you studied?” The second is “Doesn’t cancer rely heavily on genetics? 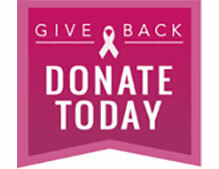 How can you teach prevention for that?” These two questions are what makes my job so pivotal in the fight against cancer. 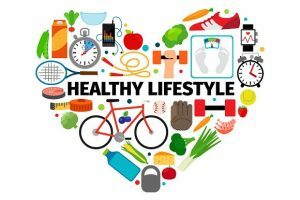 The more that we learn about how cancer begins, the more we learn that, like so many other health crises’ plaguing our population, many cancer cases can be tied into our lifestyle and habits. As a dietitian, I’ve spent many hours studying and learning about how what we eat impacts every facet of our health. From our mental wellness to our physical health, what we eat matters. We’ve known for a long time that diet plays a huge role in diseases like diabetes, heart disease, and metabolic syndrome but it’s only just recently that we’ve begun to see how big this picture really is. We are starting to piece together the links between diet, obesity, and cancer and the initial findings are staggering. According to the CDC, “55 percent of all cancers diagnosed in women and 24 percent of those diagnosed in men are associated with overweight and obesity.” That’s huge! And when we factor in the findings that cancers typically seen in older adults are showing up earlier and earlier in our youth because of the spike in childhood obesity, this is definitely cause for alarm. So when my friends and family ask why, as a dietitian, I’m providing cancer-related education, I point them to these sobering statistics. This leads me to the second question. Although cancer does have genetic links, we know that only 30% of our risk is outside of our control. The other 70% are lifestyle related. I think for so long we accepted that cancer blindly chooses its victims, which can sometimes be true but isn’t always, that we’ve become complacent with our role in our own health. I think for a lot of us it’s scary to accept that many of the choices we make day in and day out have real and lasting consequences. 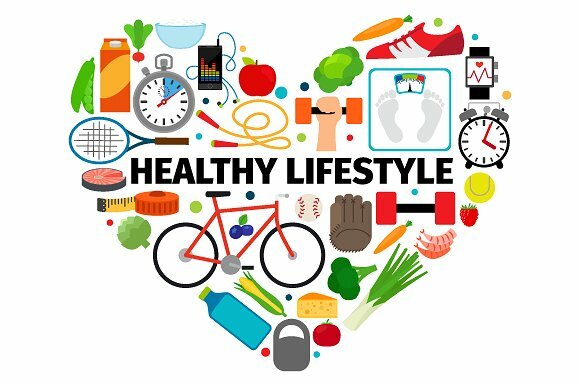 Most of us know that smoking cigarettes and vaping are activities that can cause cancer, but we can forget about the simple things like the food that we eat or how much we’re moving during the day. Although it may feel like a paralyzing amount of pressure to put on our choices, I feel this is a huge beacon of hope. If we can take back our health as a community with some simple changes, that’s everything. We have so much power when it comes to how our stories play out and it’s my hope that we can see and embrace that power. This is why I chose to educate on cancer prevention and awareness as a dietitian and this is what makes my job so rewarding each and every day.